NIC Components is pleased to announce the addition of NSPL series of three terminal low ESL solid polymer aluminum electrolytic capacitors, to its expanded SMT solid polymer capacitor products offering. 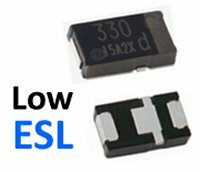 Third terminal construction greatly decreases the impedance loop, and reduces the equivalent series inductance (ESL) of the NSPL series by up to 50%, as compared to standard 2-terminal construction. NSPL series covers 68uF to 560uF capacitance values, with voltage ratings of 2.0VDC, 2.5VDC, 4.0VDC & 6.3VDC, and is supplied in low profile 7343 case size, with 1.0mm, 1.1mm, 1.4mm and 1.9mm heights. NSPL series is ideal for use as high speed decoupling capacitors, mounted in close proximity or adjacent to microprocessors to minimize and suppress high frequency noise, where use of NSPL can often replace multiple components. NSPL series feature 100KHz ripple current ratings of 6.3Arms to 10.2Arms (+45°C/100KHz) with ultra-low 100KHz ESR, down to 0.003ohm (3mOhm). Solid polymer technology has stable performance advantages over high capacitance X5R & X7R MLCCs. NSPL’s immunity to piezo-electric ringing (singing), stability over applied VDC voltage, and elimination of cracking failures (all common weaknesses of MLCCs) makes NPSL an upgrade replacement for high cap MLCCs. NSPL has operating temperature range -55°C to +105°C, is halogen free, RoHS compliant and supplied on carrier tape for automated pick and placement followed by Pb-free +260°C reflow soldering. Typical unit prices from $0.29 to $0.59 each in production volumes. Please contact NIC for evaluation samples and to review your requirements.